Ripon Runners was founded in 1985 as road running began its extraordinary ascendancy from the sport of eccentrics to probably Britain’s most participated in athletic activity. Our president, Monty Munson, now in his 80’s and still running, was one of our founder members as was Rodney Mills who in his seventies has found new fame as Britain’s over 70 indoor champion at 400 metres. The club meets twice a week: on Tuesday and Thursday at 6.30. Tuesday is the busier club night, with runners splitting into compatible groups, from absolute beginners to those with head torches who set off around Studley Park in the dark! New members are placed in a group with whom they can run comfortably. On Thursday evenings, as well as social running, we also have a group doing speed/hill/interval sessions. Many a member has seen their times improve dramatically after these regular sessions with Ian Rowbotham our regular trainer. There is a small additional charge to cover Ian’s costs but the training is designed for all standards of runner, beginner to elite. Our base is Ripon Rugby Club, which is on Mallorie Park Drive, Ripon. There are showers available for our use and even more important – the Rugby Club has a bar, which is open after running on Tuesday and Thursday. Membership is divided almost equally between men and woman and of all ages. The variety of events that we participate in can be gauged by reading the reports section, but from its origins, as an almost pure road running club, we now have regular fell runners, ultra runners and increasingly trail running has become popular. The well-known LDWA event, the Wensleydale Wedge, attracts upwards of 30 club members in spite of being held in November with over 23 miles of mud, hills and of course Dales scenery. To keep our membership fees low we organise three races a year, the famous Jolly Holly Jog, a 10k event always held between Christmas and New Year, the Ripon 10 mile, which for the last few years has been in May, and the Burn Valley Half Marathon that starts and finishes in Masham Town square. Because members are always required to help with these events we ask that they don’t participate, unless providing a stand-in helper. The club organises social events such a pub nights but with a run of course! 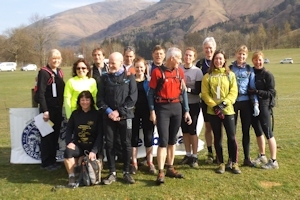 Weekend runs have proved popular with a hostel stay somewhere in the Dales or the Lake District. Ripon Runners has an increasingly enthusiastic and successful junior section under the stewardship of Helen Cox. The juniors meet at 5.15 pm on Tuesdays, also at the Rugby Club. There is no need to worry about membership of the club until you have tried us out so come down one Tuesday for a run and maybe a drink afterwards to see if Ripon Runners is for you.